The clutch throwout bearing allows the clutch actuating arm (on the rear of the transmission) to push against the clutch which is spinning at engine speed. The arm pushes against the bearing, which pushes the pushrod through a hole in the input shaft against the clutch diaphragm spring. The spring and the pushrod spin at engine speed, and the bearing isolates that movement from the actuating arm which obviously doesn't spin. The four-speed /5 transmission had a ball bearing riding on a pushrod with a 17mm end stub (see photo at bottom of page). 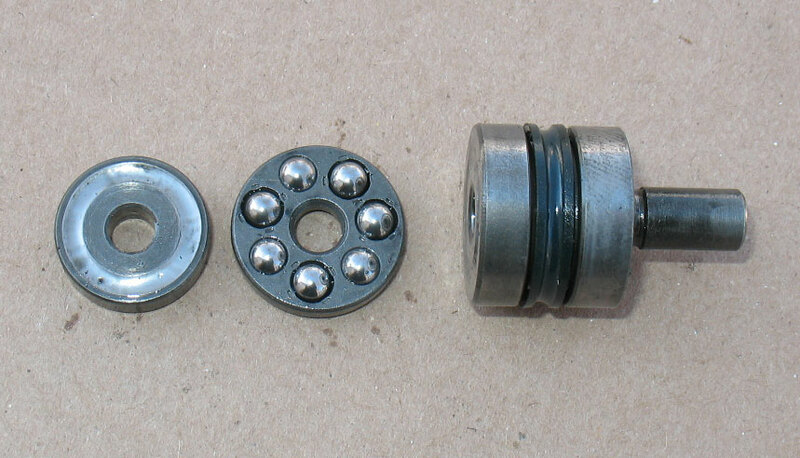 The ball bearing was very similar to the one pictured for the later 5-speed bikes but smaller. For the five-speed, the diameter of the piston was increased to 23.5mm. 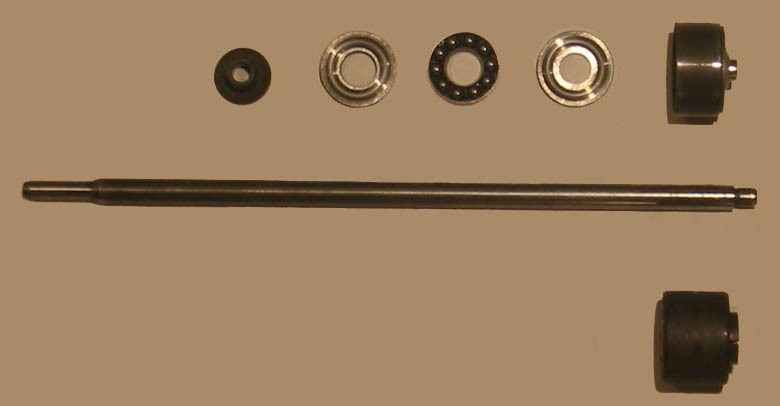 A needle bearing (shown here) was used, riding on a shorter (13.5mm) stub on the pushrod. Both races had flat surfaces. This system was used until the clutch redesign in '81. 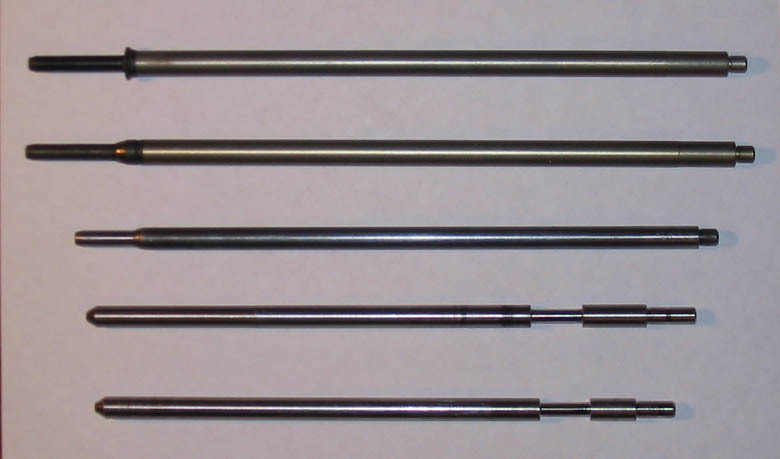 Both of these pushrods had a felt ring around the pushrod to keep oil from migrating down the input shaft to the clutch. Just to keep things interesting, the clutch arm pivot pin is larger on the 5-speed, so the arm is different also. So is the pushrod. So between the cable and the clutch, the felt ring is the only part common to the two systems. Starting in 1981, the Airheads got a clutch upgrade, which changed the transmission slightly. BMW reverted to ball bearings again for the throwout, as shown on the top of this illustration, and housed the bearing and races in a 29mm plastic piston. Bearing races remained at 23.5mm OD but now were 11mm ID to fit around the new adapter that is pressed onto the end of the pushrod. In 1988 this was all changed to the sealed needle bearing assembly shown at the bottom of the illustration. The old piston may be NLA and has been superceded by the single assembly. 23 13 1 464 167 new sealed assembly (yes, seems to be same part# as old piston). The new bearing tends to change in size slightly as it gets hot, which can be remedied by a gentle sanding on the sides. Conveniently, it is also used on all of the K-bikes and Oilheads with cable-actuated clutches. When retrofitting the new bearing, you will need to pull the bearing race and adapter bushing off the end of the pushrod. The downside is that it is very expensive (about $76) so you might be glad to scavenge one from a salvage transmission. Note: Many newer bikes - Oilheads and K12 - now list the felt ring (and a different pushrod) as standard equipment. They certainly did not all have it from the factory.